California Hospitals Make Patients Sign Away Their Right To Sue : Shots - Health News Some networks of hospitals, doctors and medical services are now so dominant in their region that they can hike their prices and force patients to waive the right to sue when things go wrong. A recent study from the University of Southern California found that prices charged by hospitals in the Sutter Health system are about 25 percent higher than those of other hospitals in California. San Francisco Bay Area companies say Sutter Health is strong-arming them into a contract that would help the hospital system secure its power over prices and potentially raise the cost of medical care for their employees in the future. Dozens of companies have received a letter, via their insurance administrators, asking them to waive their rights to sue Sutter. If they don't, a fact sheet included in the letter says, the companies' employees who get care through Sutter's network of hospitals, doctors and medical services will no longer have access to discounted in-network prices. "In both choices, Castlight and our employees lose," says Jennifer Chaloemtiarana, general counsel for Castlight Health, a tech company in San Francisco that received one of these letters this spring. She thought it was strange. Castlight is self-insured, meaning it hires an insurance company — in this case, Anthem Blue Cross — to manage the administrative details of its health coverage. But when an employee gets sick, Castlight pays the bill, not Anthem. Anthem basically functions as a middleman, including negotiating discounted prices with providers like Sutter. "We don't have a direct relationship with Sutter Health," Chaloemtiarana says. "So the letter was unusual in that regard, because it asked us to make certain legal agreements with Sutter." The letter is from Anthem Blue Cross, but it says if Castlight has any disputes with Sutter, Castlight has to agree to arbitrate with Sutter Health. Castlight can't sue. And if it doesn't agree, Castlight's employees will lose their in-network medical rates. This makes Chaloemtiarana uncomfortable. She's heard from her counterparts at several other companies who also don't know what to do. "Everyone's struggling with it," Chaloemtiarana says. "Nobody has signed it happily and thought it was fine." As an employer that pays its employees' medical claims, Castlight doesn't like the idea that it will never be able to challenge Sutter over its prices in open court. To Chaloemtiarana, waiving that right would only help strengthen the power of Sutter's "already dominant" provider network. 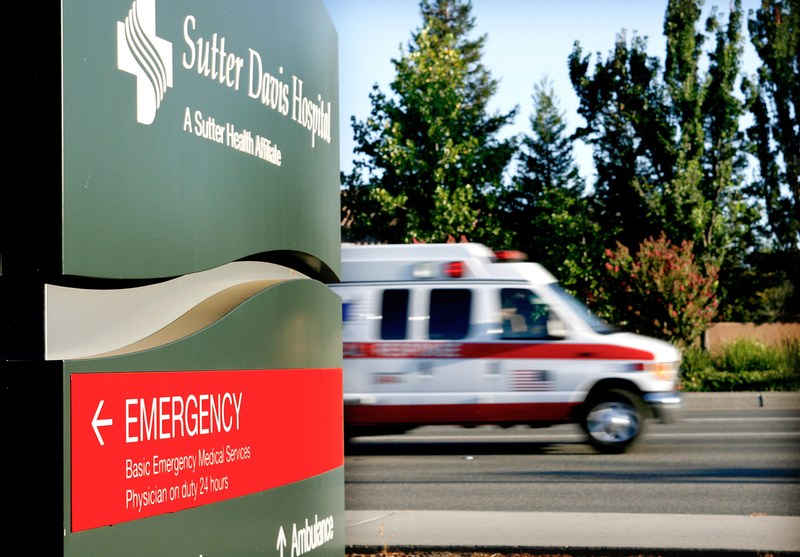 Sutter is the largest medical system in Northern California, with roughly 30 percent market share of the hospitals, surgical centers and doctors' groups, according to a data analysis by Christopher Whaley, a research economist at the University of California, Berkeley. In comparison, Whaley says, the largest medical system in the Los Angeles area has 5 percent market share. Economists have long argued that Sutter uses this power to charge more for its services. Sutter's hospital prices are about 25 percent higher than other hospitals around the state, according to a recent study from the University of Southern California. "Having a very strong, dominant provider system will reduce choice for our employees," Chaloemtiarana says. "We want them, over the long term, to have choices in high-quality, low-cost providers." Refusing to agree to the arbitration clause, she says, allows her company to "maintain our flexibility in fighting against what we consider to be difficult, anti-consumer provisions in provider networks." Sutter rejects these claims and the research findings. "Recent academic studies have been one-sided and misrepresent the competitive environment of Northern California," said Bill Gleeson, vice president of communications for Sutter, adding that the studies "unjustly inflate the so-called market share of Sutter. There's competition all around." Castlight and the other self-insured companies believe they're being asked to agree to the arbitration clause because of a lawsuit Sutter is facing from UFCW & Employers Benefit Trust which funds health coverage for 60,000 members of a grocery workers' union. UEBT is alleging that Sutter uses unfair business practices to maintain its power over prices. "They've put a stranglehold on the competitive process in the Northern California health care market," said Richard Grossman, UEBT's attorney. "And therefore they're free to raise prices without limit, and they have." Sutter rejects these claims, too, and argues that UEBT should have to arbitrate its disputes behind closed doors. The company says the arbitration agreement Sutter has with Blue Shield, UEBT's insurance administrator, also applies to UEBT. But the judge in the case disagreed and so did an appeals court. "My client had never agreed to arbitration, had never seen a contract that included an arbitration clause. And so we opposed that," says Grossman. "The judge agreed with us and said, 'Sutter, you cannot force them into arbitration.'" Grossman says that's why Sutter now wants other self-insured companies like Castlight to actively sign the arbitration agreement and give up any future right to sue over prices or to claim anti-competitive practices in open court. Again, if they don't, their employees will have to pay higher out-of-network rates at Sutter hospitals and doctors' offices. "They want to force any disputes into confidential arbitration so their misdeeds cannot be exposed in a public courtroom," Grossman says. Sutter says the goal of the arbitration agreement is "transparency." "We've taken a very proactive, very transparent approach, to making sure that the health plans provide these important clients of theirs with all the key terms of their agreements," says Gleeson. "And that includes rates." Pressed to comment on the decision Sutter is asking self-insured companies to make — to give up their right to sue or give up their lower prices for medical care — Gleeson says companies "can't accept deep discounts and make up their own rules." Castlight has until mid-November to sign the agreement, or face the consequences. Chaloemtiarana says she's going to try to negotiate with her insurer over the Sutter arbitration agreement. But she's not sure how things will turn out. Castlight itself is in the business of trying to make health care more transparent — it makes a software platform where employees get information about their health benefits, service costs and quality, so they can make better decisions about their care. Chaloemtiarana says, out of principle, and for the long-term mission of improving health care, Castlight must "stand up against" Sutter.